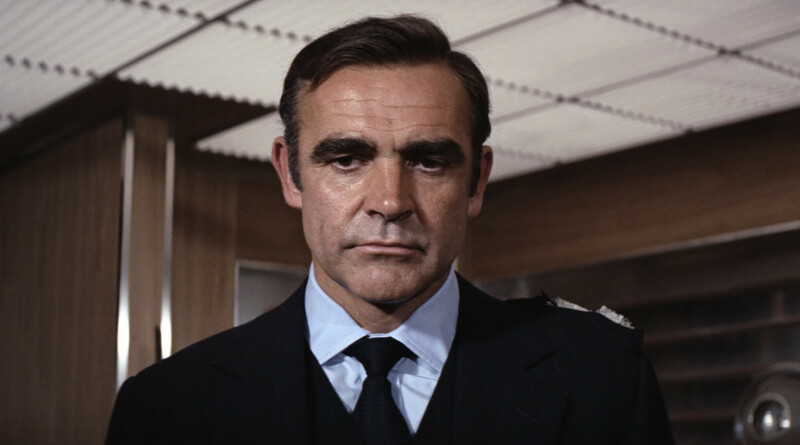 No, I’m not talking about the Miles Davis tune “All Blues.” Usually when Sean Connery wears a blue suit in the Bond films, everything else he wears is blue. Well, everything but the black shoes and white pocket handkerchief. 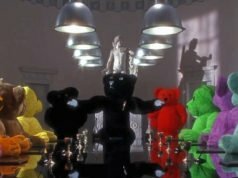 The first time we see the monochrome blue outfit is in M’s office in From Russia With Love (pictured above). He wears a solid navy suit with a matching solid navy tie and light blue shirt. A light blue shirt is very important since it provides contrast from all the dark blue in the suit and tie. Though both the suit and tie are navy, the tie is a little lighter than the suit. To some, this mismatch is not desirable, and it’s practically unavoidable when pairing two items that are very close in colour. Those people would say to avoid wearing things close in colour to avoid the mismatch. But it’s an integral part of the classic Bond look. Once again in You Only Live Twice (pictured above) we see the same all blue outfit. This time the suit and tie are reversed: the suit is light navy and the tie is dark navy tie. Do you think it’s better for the tie to be slightly lighter or slightly darker than the suit? Ideally, it’s best to get them as close as possible, in not only the value (lightness or darkness of a colour) but also the hue (gradation of colour). A warm blue tie will not go well with a cool blue suit, even if they are similar in value. A matching hue is more important than value when pairing a navy tie with a navy suit. Connery brings back the all-blue look in Diamonds Are Forever (below), this time with blue chalk stripes added. This outfit has Connery’s closest suit and tie match, and the tie is only a little lighter. 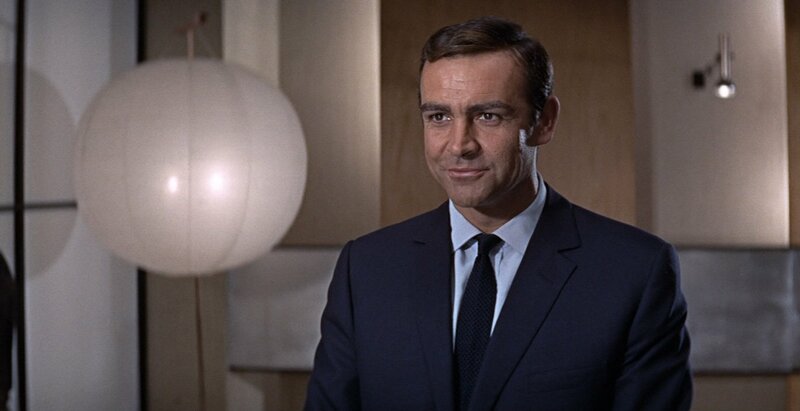 I also can’t leave out the navy grenadine ties that Connery wears with his navy blazers—to which he always gets a close match with the tie—but with grey trousers there’s no longer a monochrome look. Roger Moore starts out as Bond in Live and Let Die wearing a blue suit, blue overcoat, blue shirt and blue tie (pictured below). But does this outfit qualify as monochrome? Even though the tie is primarily navy, the red stripes technically disqualify this outfit from the all blue category, but for the purposes of pairing a blue tie with a blue suit, it’s all blue. The tie is the darkest navy of the outfit, followed by the overcoat and then the suit. They are all very similar. We don’t see Bond wearing a blue monochrome outfit again until Daniel Craig becomes Bond. I’m not going to count the navy linen suit and light blue shirt worn in the black and white pre-title sequence, since the scene is black and white, and a large brown belt breaks up the blue. But the first suit in Quantum of Solace (pictured below) is very similar to Connery’s striped suit in Diamonds Are Forever. The suit is navy with light blue stripes, the shirt is pale blue and the tie is a pattern of mid blue and black squares. The blue and black of the tie combine to make it look navy overall. The tie does not to completely disqualify the outfit from being all blue, but it doesn’t have the 100% monochrome look of Connery’s classic outfits either. The patterned tie is much easier to pair with the suit than a solid navy tie is. The navy-on-navy look is something Bond has inspired many to copy, but it’s not easy to get right. And whether Bond gets it right or not is up to you. If you attempt this look, it helps to have multiple solid navy ties in your collection and good lighting to figure out which one works best with the outfit. You could also include Craig’s 3 piece Brioni suit at the end of CR. The belt is hidden beneath the waistcoat. I think the colour of the pinstripes can be overlooked the same as black shoes and pocket squares would be. The white in the stripes and tie is why I didn’t want to include it. The all blue outfit is the quintessential James Bond dress code, in my opinion. It combines classic, understated style and elegance with 007’s naval background to create a timeless look. It’s simple, and effective. I agree that it’s hard to replicate for lesser mortals: the entire ensemble needs to be coordinated closely. As to your question, I would say a darker tie is preferable. Since the starker colour guides the eye of the viewer towards the face, while a lighter colour weakens the straight line created by the tie. I also prefer the tie to be darker. It seems to be easier to match and, in overall appearance, it pays tribute to the standard ensemble of the literary Bond, navy blue suit with black knit silk tie. The first time I really noticed a blue on blue suit was on Mallory in Skyfall. I initially didn’t like it, thinking it lacked anything exciting to draw the eye, but the more I looked at it the more it grew on me. The exact shades are very important to get correct, and I think he did. That very much backs up the idea that it’s a fine line between pulling it off and not bring able to. As a side note, I can’t think of any other colour in which you could do it. I used to wear a grey suit, very light grey shirt and dark grey tie and I look back now in regret. Perhaps it was because of this I was hesitant about Mallory’s. At least with blue you get colour, all grey seems awfully bleak. I thought Craig pulled off a pretty good all grey ensemble at the end of Skyfall, issues with the fit aside. Actually, that suit is navy. Really? When I commented a few months ago about it being navy, you told me it was a dark charcoal, citing the Bond on Set book. Did I? Sorry. I later found out it’s actually a very dark navy from ajb007.co.uk, when someone there was able to find out the actual Tom Ford cloths that were used. I think this look is terrific, very much of its 1960’s era, and also back “in” now. I don’t think I agree it is difficult to pull off – -without any other color, I am not sure what there is to go wrong provided one sticks to blue suit, a tie near the same color (I too prefer darker) and a light blue shirt. And I agree this is the quintessential Bond suit, with its roots in Fleming’s descriptions. Yes. I mentioned that in the article on that outfit. I could be wrong but I think Robert Brown wears an almost identical navy regimental tie as M in The Living Daylights. The Royal Navy, like a few other British military organizations, has a wide-stripe version of its regimental tie. Ben Silver sells both versions. 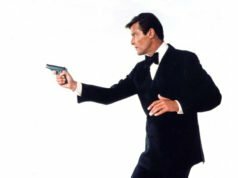 Actually Roger Moore also wears an all blue outfit with a shirt with double cuffs with his Castle navy suit with a ribbed navy tie in promo stills for LALD. It seems to be early publicity shots, some with the lovely Jane Seymour. I suspect (from the teaser trailers) that it is what Moore wears in his first gunbarrel. Matt,I know you base your work mainly on screen appearances but this can make a point. I’m aware of that outfit, but I didn’t include it since it wasn’t in the film even though it is in the gun barrel. 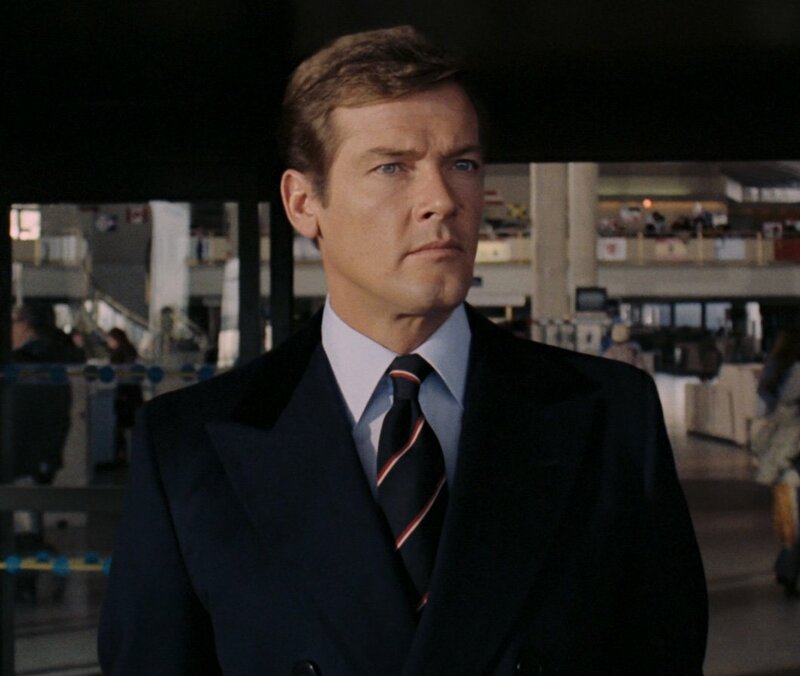 The navy suit that Roger Moore wears under the overcoat mentioned here is the same suit. I don’t think Frank Foster had made Roger Moore’s shirts yet for that shot since Cyril Castle’s flared link cuffs are meant to be worn with cocktail cuff shirts. Double cuffs look off with the link cuffs on the suit. I agree that it’s better to go darker with the tie. Matt, I know that Bond’s shirt is blue in the opening scenes of Quantum of Solace, but is it as light as it looks, or is that simply the effect of it getting dirty during those scenes? Until I saw the BluRay, I was convinced it was white. I really like this monochromatic look. It gives a nice contrast between suit-shirt-tie while still keeping in the same color. The pale blue shirt I especially like. I also agree with the opinion that the darker tie would be better in this case. It gives the tie more presence. Personally not something I like. Well, solid navy with solid navy, that is. I would have preferred that he at least wore a black tie with the first two navy suits pictured and his blazer from Dr No. On the other hand, stripes — either on the suit or tie — break up the effect and make it work a little better. The two colour patterned tie of Daniel Craig also helps differentiate it from the striped navy suit. I sometimes wear a repp striped tie that has a navy ground with my navy blazers, it’s rather like Roger Moore’s outfit. A guilty pleasure if you will. 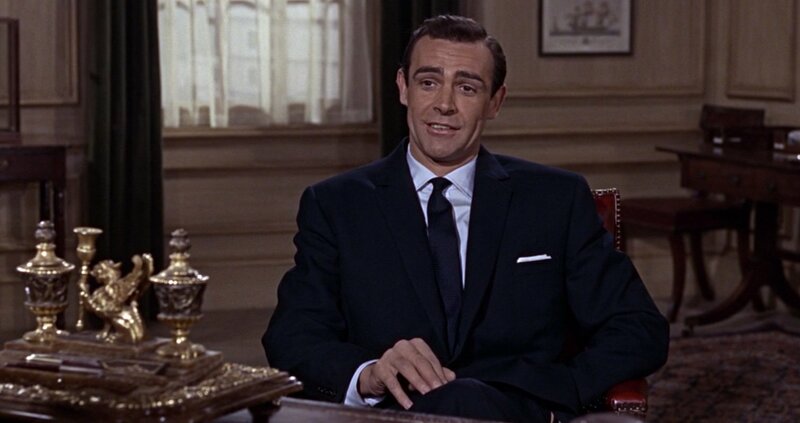 I personally do not care for a black tie with a navy suit, and it’s not something we’ve seen in the Bond films. I prefer the navy tie with a navy suit. so do I. To me, that combination is more Bondian than the black tie/navy suit. I too prefer a darker tie. Uniform ties are often black because it will look like really, really deep navy. So too, a white shirt can look like really, really pale blue, and help or hinder contrast when attempting to match very similar colors. Of course, lighting is a consideration. What I notice the most about the pictures above is how terribly Connery aged in such a short time…what a difference weight makes! But on a serious note, I also prefer the tie to be darker myself. The monochrome look is an interesting one, and one that I hardly ever see anyone use. I’m a tremendous fan of Connery’s Bond, and I have two navy suits but I never use them for this type of look myself. However, through pure luck I have a linen blazer, cotton pants, and a silk tie that are all as close as possible to the same indigo blue as you could get. It’s a really interesting look for the summer with a pale blue shirt. I also recently wore an all-grey look, and was surprised at how successful it was. It was a charcoal grey pinstriped suit with light grey shirt and a textured charcoal tie. Something about it seemed somewhat 80s to me but people thought it looked rather nice and elegant. The only thing is that I think someone with different colouring could pull it off better (I have an olive complexion and salt-and-pepper hair). That’s an original article. The blue-on-blue look is really connected to Bond’s naval officer past, indeed. I think a darker navy tie with a lighter navy suit is better. I just said that after comparing Connery’s look in FRWL with his look in YOLT. In FRWL I think both the suit and the tie color are a bit too dark for the very, very pale blue -actually it looks almost white in some shots- shirt. A medium blue shirt would have been more appropriate in my opinion. On the other hand, I think the very pale blue shirt + dark navy tie is a look that looks better with a dark grey suit for Connery -see his suit when he travels in the train for example. This grey suit -like almost every other grey suit he wore in this movie- is certainly less dark than his navy suit. The “all color look” is certainly great in blue, but I think it can work with the grey color (for example mid grey suit, light pearl grey shirt, charcoal grenadine tie and white pocket square to make the ensemble look less severe/boring) and the brown color too, depending of one’s hair and complexion. It would have been nice to see Lazenby or Brosnan sporting this all navy look, but on the other hand it’s quite important that every Bond actor should have a style of his own, not just a poor copy of Connery’s style. On another note, Moore’s navy Chesterfield coat is certainly one of the best overcoats of the entire series. I like the navy regimental tie too, was he the only Bond to wear striped club ties onscreen ? The coat is THE best in my opinion and looks superb. Perfect introduction to the Moore era! Speaking of an all grey outfit, can a charcoal suit, light grey shirt and black tie be called monochromatic? I always thought most black ties are actually very very dark shade of grey. On that note, would you call the hacking jacket outfit Connery wore in Goldfinger as monochromatic? Its a brown barleycorn jacket, light brown trousers, ecru shirt and light brown tie. He even wore brown suede shoes. “Do you think it’s better for the tie to be slightly lighter or slightly darker than the suit”? Yeas a think that a more dark blue (or black) tie work better on solid navy suit or blazer. I love wear a silk knit black tie with my blazer or blue suit. I think also that with solid blue suit and tie,is better that the shirt is solid white or white with tiny light blue or gray strips. Light blue shirts with this outfit is sad,in my opinion. I agree with you and the others that a tie darker than the suit works better, but I never liked the look of a black tie with a navy suit. Black ties are great with an air force blue or marine blue suit, because they have more contrast. Is incredible see as fast was the aging of Connery! Between “From Russia With Love” and “You Only Live Twice” are five years,and Connery was 37 years; he seems some year more old,but is ok. But the real shock is between “You Only Live Twice” and “Diamonds Are Forever”!!! Less of five years from YOLT and Sean seems more old of fifteen years! At the time of DAF Connery was 41 year,and seems like he have much more of 50! Which one of Bond’s all blue looks do you like the best? I personally like Craig’s in Quantum of Solace. I think Connery’s outfit in From Russia with Love is the best of all of them. I personally love the all blue look, especially since blue is my favorite color. I like to wear navy suits(solid or pinstripe) with blue shirts the best, and gray suits with white shirts. I know that with Daniel Craig’s complexion, blue shirts go better with gray suits and white shirts with navy suits. Since I have medium brown skin and black hair, do you think a white shirt or a blue shirt looks better on a navy suit? What about for a charcoal suit(The London one in Quantum of Solace) or medium gray suit? Does a white shirt or blue shirt look better with that? Also, with navy suits I would wear navy or mid-blue ties. With a charcoal suit, burgundy tie, and medium gray, black. Do you think I could wear an all blue look with brown shoes and a belt if necessary? I think that navy suits look better with brown shoes and belts than does black. Do you like these? What do you think I could do to improve them if needed? The all blue look is my second favorite Bond look and the FRWL suit, in particular, is probably the best example in the series. I wonder how it would have turned out if he had stuck with the Gingham check shirt though?